Additional Info: Sweden is one of the most child-friendly countries in the world, wherever you want to go the kids are welcome. Sweden offers an opportunity to catch some big fish in some interesting and diverse locations. Its great if you are a beginner or quite the advanced angler. You will find some of the best Pike fishing in the world as well as plenty of fly fishing opportunities, and coastal fishing. Fishing from a boat is very common in Sweden. Many lakes and rivers are big, so fishing from a boat can add a new dimension and offer better catches. In many places it's possible to hire a boat with or without a motor. In Sweden it is also usual to use a fish finder to make it easier to locate the best fishing areas. Spinning is the most common method of fishing and often the most effective method when fishing for predator fish. Common bait for pike, zander, salmon and trout is the wobbler, but even spinners and spoons can produce good catches. When you fish for sea trout along the coast, long thin spoons, often combined with a fly on a dropper can be rewarding. 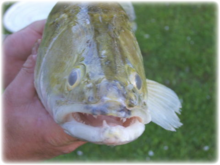 Coarse fishing is a good method for perch, pike and zander fishermen, who use live or dead bait. Ice fishing is a very common method in the northern parts of Sweden, where the ice is extremely thick for a large part of the year. Things get interesting when you start looking at the area on Sweden's south coast around towns like Karlskrona. The fishing becomes dramatic as you move up the eastern seaboard to Stockholm and beyond. Vastervik is a fantastic center but anywhere there are fjords, bays and offshore islands, you're in with a good chance of some sensational pike fishing. Piking begins as early as March but most local experts tend to take things seriously from April and May when the big fish come close into the shallow reed beds to think about spawning. It's around this time that the really huge females can be located more easily and at this time of the year they can weigh very heavy indeed. This type of pike fishing demands the use of a boat. You just cannot get to the right areas from the bank and, anyway, mobility is a really important key to success. Fortunately, Sweden is a nation of boat lovers and virtually every village has its own little boat yard where craft can be hired reasonably cheaply. Lapland - About a quarter of Sweden's surface area is in Lapland. The Royal Trail is the best known trail in the mountains stretching from Hemavan in the south to Abisko in the north. It provides excellent hiking and wide diversity of terrain. Hemavan - Ammarnas is probably the most suitable section for those visiting Tarnaby/Hemavan. Most of the trail passes through Vindelfjallens Nature Reserve with its impressive landscape and rich wildlife. There are five cabins between Hemavan and Ammarnas, open for a small fee to travelers. The cabins are open all year and a steward lives there during high season. Ammarnas is a picturesque village in the centre of Vindelfjallens Nature Reserve with a population of 230. Most work within tourism, reindeer herding or handicrafts. There is a post office, petrol station and general store. It is the perfect place to stay.